Black Friday....Cyber Monday....Trying to find a meaningful Christmas gift can be stressful and often makes one forget the real meaning of Christmas. Christ! During this time we should be drawn to thankfulness. Being thankful for Jesus, his birth, life, and sacrifice for us. Without Him there is no reason to celebrate after all. All throughout the year, our focus is to share the love, compassion, mercy, and truth of the Gospel with people in the Dominican Republic, Brazil, and Asia. We do so by helping meet immediate physical needs such as providing training so that women can earn a living for their family, school scholarships so children in the DR can have an education, and medical clinics so low income families have access to trained doctors and medicine. This Christmas you can avoid the malls and online shopping to give a gift that gives back to the people of Brazil. You can choose an ornament that describes the needs of a child, adult, or entire family in rural Brazil. By choosing an ornament, you are committing to purchase either a hygiene pack (which you can shop for yourself) or to donate $50 towards a water filter. 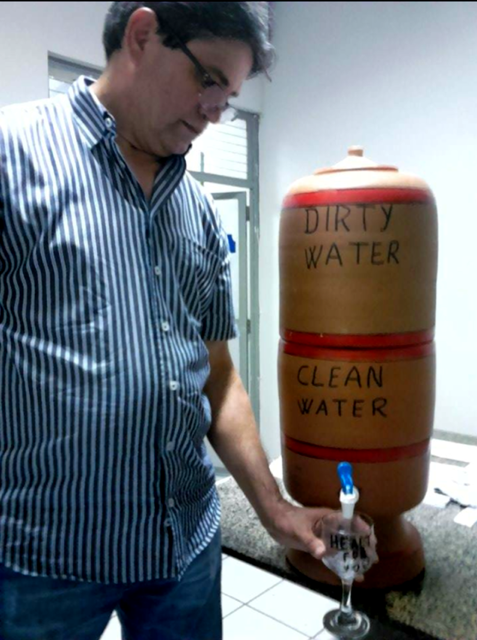 This filter will be used by an entire family to provide clean water to drink, cook with, and wash dishes. You can email rcox@onevisionintl.org to sign up for a ornament or stop by our office at 2915 Alcoa Highway to pick one off of our tree. These hygiene packs and water filters help keep parents healthy so they can provide for their families and help kids avoid treatable illnesses so they can stay in school. When believers pass these packs and filters out to needy families it also opens the door to share the REASON we give. We give because Christ first gave to us. We sacrifice for others because He sacrificed everything for us. Consider giving a gift that makes a difference!